This review handout helps students think critically about the story and discuss it with literary terms. 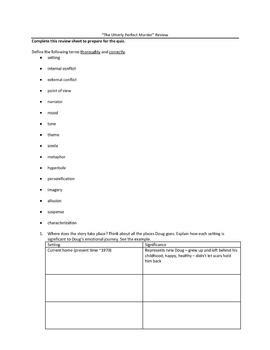 The handout addresses the following concepts: setting, internal and external conflicts, point of view and narration, mood, tone, theme, and figurative language. Students are not asked to merely identify; instead, they must explain the purpose or significance of these concepts in the story. This review handout was designed to prepare students to take a quiz on the story; each section of the handout relates specifically to questions on the quiz.